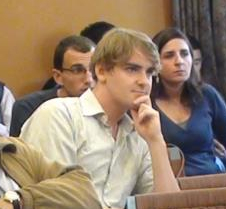 Owain Lawson is a doctoral student studying the twentieth-century Middle East. His research focuses on the history of science, technology, and the environment in Lebanon and Greater Syria. He is developing a dissertation that explores the history of Lebanese hydroelectricity, funded in part by the Social Sciences and Humanities Research Council of Canada. Born in Ottawa, Canada, Owain received a B.A. from Concordia University in Montréal and an M.A. in Middle East Studies from the American University in Cairo. He is currently assistant editor at the Arab Studies Journal and research coordinator for the Arab Studies Institute’s Knowledge Production Project. Between his degrees, Owain worked in reforestation and conservation in remote areas of the Canadian Northwest and traveled, studied, and worked in Egypt, Lebanon, Jordan, and Tunisia.